A fire near Colorado Highway 131 and Routt County Road 14 threatened structures Sunday afternoon, but was contained that evening by Steamboat Springs Fire Rescue and Oak Creek Fire Protection District firefighters. Editor’s note: This story was updated at 8:45 p.m. Sunday. STEAMBOAT SPRINGS– After 4 p.m. Sunday, a fire broke out on private land near the intersection of Colorado Highway 131 and Routt County Road 14. A couple of structures, including a home and a barn, were threatened, said Routt County Emergency Management Director David “Mo” DeMorat. The fire was smaller than five acres when DeMorat left to respond to a second fire north of town, he said. The fire was contained Sunday evening without any major structures lost, but a lean-to and a beehive burned. Steamboat Springs Fire Rescue and Oak Creek Fire Protection District firefighters responded to the fire. At around 5:45 p.m., a second fire sparked north of Steamboat Springs off of Routt County Road 44, about six miles north of the Steamboat Springs Airport, DeMorat said. The fire threatened a home. Officials were able to contain the fire to about three-quarters of an acre, DeMorat said. No structures were lost. 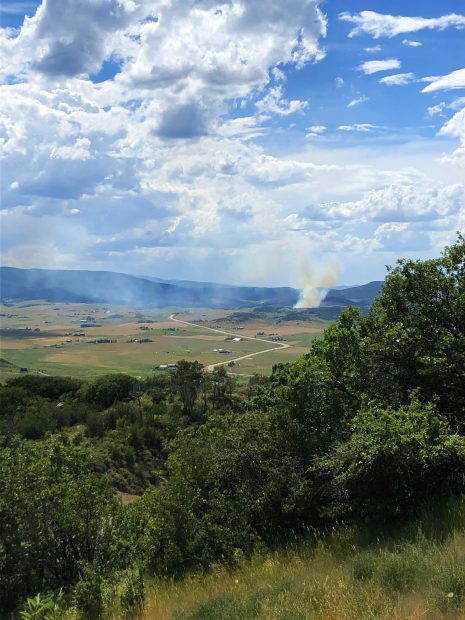 Steamboat Springs Fire Rescue, North Routt Fire Protection District and Bureau of Land Management firefighters responded to the fire north of Steamboat. “It’s been a busy day with lightning and it being so dry, but they got them both contained without losing anything,” DeMorat said.